MAXJoypad can control the games that you play on your PC with a mobile device. The tool turns your Android device (mobile / cell phone or tablet) into a gamepad. It requires a Bluetooth or WiFi connection between the smartphone or tablet and the PC and supports up to four connected devices at a time. 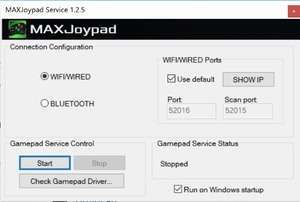 For security reasons, you should also check out the MAXJoypad download at LO4D.com which includes virus and malware tests. Additional screenshots of this application download may be available, too.